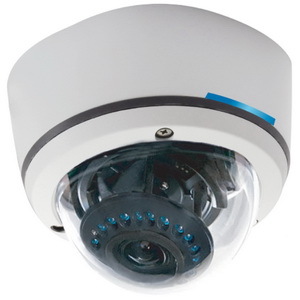 The AV770WD security camera adopts the innovative "seawolf" image sensor and the resolution is as high as 690TVL-E. It has advanced 3D noise reduction technology, digital WDR, glare suppression, and other functions. IR-CUT filter switchover technology will switch the filter to obtain ideal pictures with its mode changing. Powerful OSD menu includes brightness, contrast and color saturation adjustments, multi-area BLC, white balance, AGC and other functions, which ensure clear and bright pictures. Mirror, motion detection, privacy and other aided functions make it suitable for various special environments. Fashion professional design and unique three-dimensional bracket help to carry out a 24-hour monitoring and an easy convenient operation. AV900WD adopts the innovative "seawolf" image sensor and the resolution is as high as 690TVL-E. It has advanced 3D noise reduction technology, digital WDR, glare suppression and other functions. Powerful OSD menu includes brightness, contrast and color saturation adjustments, multi-area BLC, white balance, AGC and other functions, which ensure clear and bright pictures. Mirror, motion detection, privacy and other aided functions make it suitable for various special environments. Fashion professional design and unique three-dimensional bracket help to carry out a 24-hour monitoring and an easy convenient operation. WDR Cameras You Can Count On!